The third edition of New Zealand’s only Māori literary journal Ora Nui goes on sale this week, after an Auckland launch at the Tim Melville Gallery on 19 August. Ora Nui 3, Going Global takes Māori literature into an international space by including literature, art and photography from not only Māori writers and artists, but contributors from Asia and Europe. “Ora Nui continues to evolve as a space for experimental Māori literature,” says editor Anton Blank. “What we see in this edition is an increasing diversity of Māori voices from Aotearoa New Zealand and abroad. There is no template for the Māori identity anymore. These writers are all influenced by traditional cultural markers like tikanga and te reo Māori. But there are also new forces at play. “Many come from multi-cultural backgrounds, and the influence of travel is very present. They are also digital natives so social media and the internet are very present. Māori writing feels very layered. Culture is more complex, nuanced and shifting. “By juxtaposing Māori prose with Asian and European writing, similarities and differences emerge. There are obvious differences in the use of language and metaphor but there are common themes of identity, diversity, nationhood and cultural evolution. Essentially a very disparate group of writers is often writing about the same things. 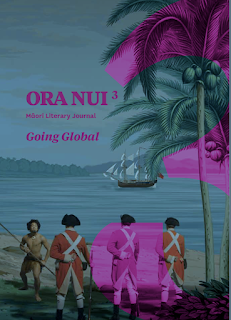 Ora Nui, Māori Literary Journal was launched in 2012 and is supported by funding from Creative New Zealand.